When it comes to teaching, many assume the older grade levels—6 through 12, specifically—are the easiest to teach. After all, in may cases you are completely done with elementary school, your students are older and more disciplined, and all you truly have to worry about is helping them learn what they’ll need to know for high school or college and beyond. Prepare with our OPTE Study Guide and Practice Questions. Print or eBook. Guaranteed to raise your score. Get started today! If you’re studying to become a 6-12 educator, however, you know this idea is furthest from the truth. Teaching grades 6-12 is as demanding a career choice as for any of the lower grade levels, with its own unique set of responsibilities you must master before you can enter the field professionally. Oklahoma’s Office of Educational Quality and Accountability realizes the importance of this career choice, which is why they require all teachers within your field to earn a passing score on the OPTE: 6-12 exam. At Mometrix Test Preparation, we understand as well as you do how important this exam is to your future career goals. Without passing this exam, you won’t be able to officially start your career. To help you navigate the road to success, we’d like to offer help in the form of our OPTE: 6-12 (076) practice test. Designed with accuracy in mind, you can use this free study tool to familiarize yourself with the test’s contents and get to know your own strengths and weaknesses with its subject matter. 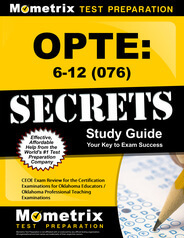 Our OPTE: 6-12 practice test covers everything you will need to know to score well on the real thing. The full exam span 78 questions in total. OPTE Flashcards. 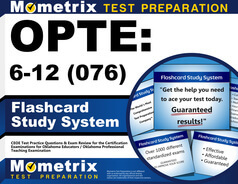 Proven OPTE test flashcards raise your score on the OPTE test. Guaranteed. Learners and Learning (10 percent). This free study tool pairs well with our OPTE: 6-12 study guide, but can also be used standalone. Feel free to incorporate one or both of our resources into your study plan! Good luck!